Before I even started planning a trip to Niagara Falls, I knew I wanted to do the Maid of the Mist boat ride. It’s the iconic thing to do, right? Well, once I started doing my research, I learned there is also the option of doing Hornblower Niagara Cruises. I wasn’t sure how to choose the best Niagara Falls boat tour or if we should try to do both? Our time was limited, so realistically we needed to pick either the Maid of the Mist or the Hornblower. 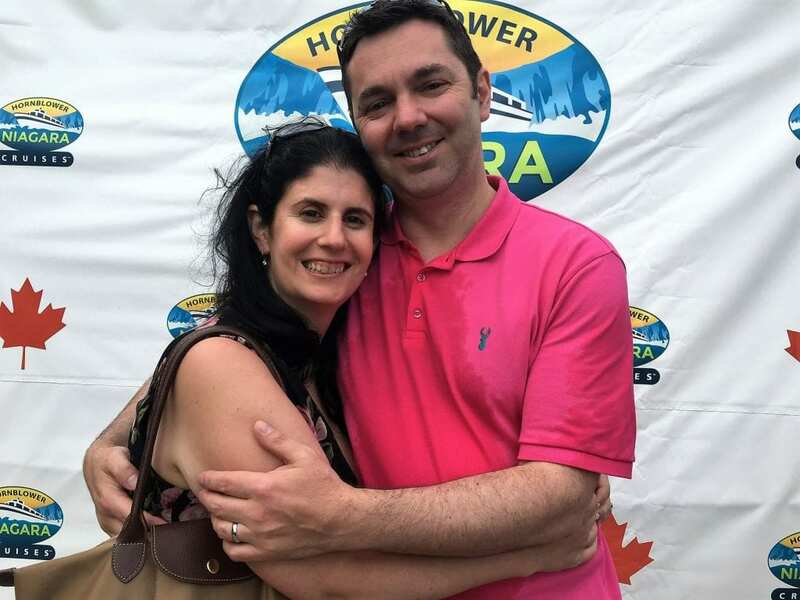 I wanted to share my personal experience and research with you to help make the Hornblower Niagara Cruises vs Maid of the Mist decision easier for you. Hornblower vs Maid of the Mist: What’s the Difference? Maid of the Mist or Hornblower Niagara Cruise? The biggest difference between Hornblower Niagara Cruises and the Maid of the Mist is the history. You may remember the Hornblower cruise we did to Alcatraz Island last year. While Hornblower has been around for over 35 years, they have only been offering cruises on the Niagara River since 2014. The Maid of the Mist first carried passengers across the river in 1846! In 1848, when the bridge across the river opened, demand for the Maid of the Mist fell. They rebranded the Maid of the Mist as a tourist boat and it has been taking passengers ever since. Honestly, there isn’t much of a difference between the two Niagara Falls tours. 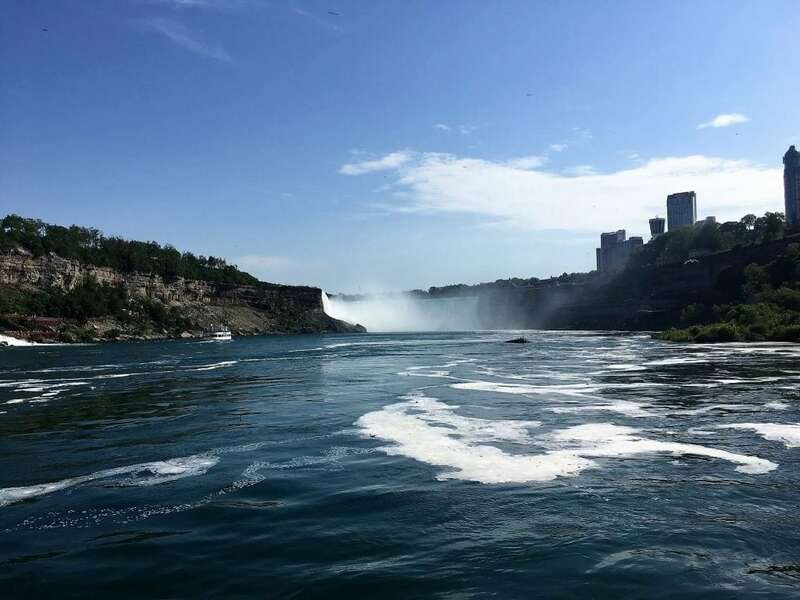 Both boats take basically the same route on the 20-minute long cruise and go close to all three of the waterfalls (the American Falls, Bridal Veil Falls, and Horseshoe Falls) that make up Niagara Falls. The Hornblower Cruise is the boat tour in Niagara Falls, Canada and the Maid of the Mist docks on the American side, literally across the river from each other. Only Hornblower Cruises offers the Niagara Falls Illumination Night Cruise and Niagara Falls Fireworks Cruise. The weekend we were in Niagara there were no fireworks so we thought about doing the illuminations cruise but just didn’t have enough time. The cost difference for the cruises might be more if you have kids. Maid of the Mists is free for kids 5 and under with an accompanying adult, while Hornblower only lets kids 4 and under on for free. It is a minor detail, but if you have twin 5-year-olds like one of my readers, Pauline, it can add up. Both cruises provide all guests with ponchos. Spoiler alert: you will need them! The Maid of the Mist poncho is blue and the poncho for the Hornblower Cruise is red. As long as you get a poncho, that should be fine. 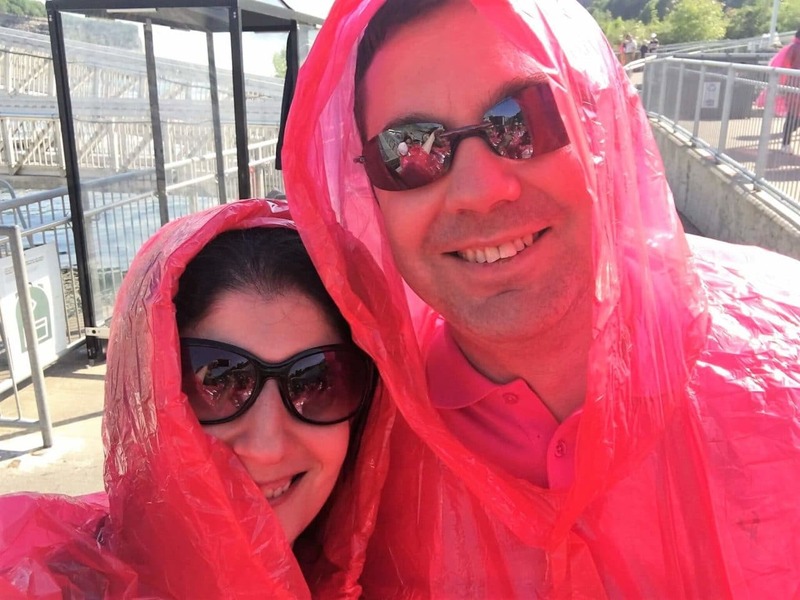 Color should not be a deciding factor in choosing your Niagara Falls Boat Tour! Since the differences between the two Niagara Falls boat tours are insignificant, the deciding factor is which side of Niagara Falls you are on. Border crossing does take time, and there are fees (only a few dollars) whether you walk across the Rainbow Bridge or drive across the border. If you are on the American side, then do the Maid of the Mist. If you are on the Canadian side of Niagara Falls, then it makes more sense to do the Hornblower Cruise Niagara Falls. We were staying on the Canadian side, so we decided to take the Hornblower. We could have also done the Maid of the Mist if we would have done the boat ride the same day we did the Cave of the Winds since that is on the American side of the falls. You can see the river looks pretty calm heading towards the Horseshoe Falls. Luckily, regardless of what boat you choose, it will be an experience you will always remember. We had a great time! The Horseshoe Falls is where the boat ride really gets intense! Only Hornblower offers cruises to see Niagara Falls at night. You can either do a Niagara Falls Illumination Night Cruise or the Niagara Falls Fireworks Cruise depending on if there are fireworks scheduled that night or not. The evening cruises run from the beginning of May until the end of October. These cruises last 40 minutes and do sell out quickly, so you will want to get your tickets in advance. If you like you can save a little money by purchasing a Day & Night Cruise Package, which includes a day cruise and one of the extended nighttime rides. I should also mention that these extended night cruises do include a cash bar, light snacks for purchase, and music. 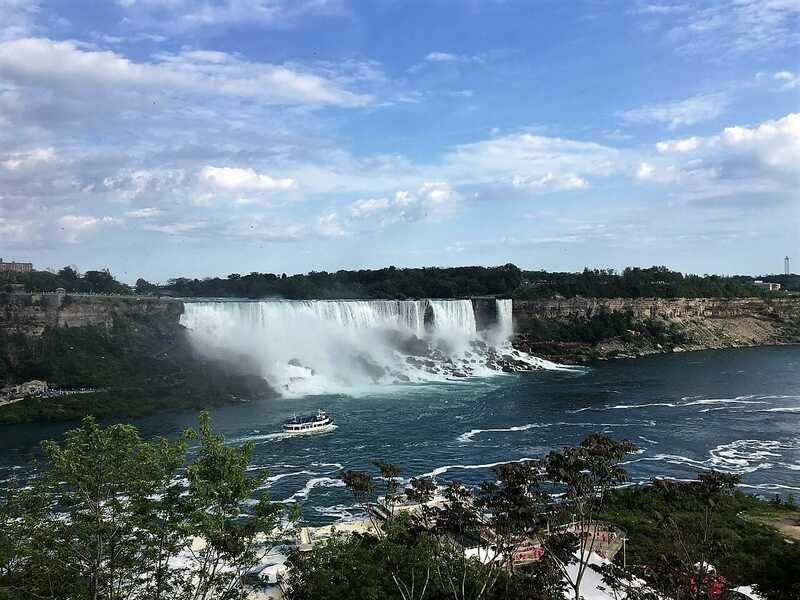 Hornblower does also offer 20-minute long Voyage to the Falls Evening cruises as well for the same price as the daytime cruise. During this cruise, you would also get to see the falls illuminated. All the evening cruises are described as a “light mist experience” rather than the “full mist experience” of the daytime cruises. I am guessing with the “light mist experience” you would still get wet. The boats do have indoor areas if you want to make sure you stay completely dry. I’m not sure you would get the full experience if you stay inside the whole cruise though. My experience on my Niagara boat tour was different than I expected. I thought that as we got close to the Falls the water would get pretty rough. That wasn’t the case. The water seemed to be pretty calm but the mist and wind were much more powerful than what I expected. You need that poncho and you need to tie it tight. I had to hold on to poncho in order to keep my hair somewhat dry. Even with holding onto my poncho my hair did get wet though! Since you will get wet anyway, it could be a good thing to do when it is raining in Niagara. It’s best to allow time to dry! We were happy we were able to go back to the hotel and change before dinner. If you do your Niagara boat tour on a chilly day, you will want to get out of your wet clothes as soon as possible. I should mention there is no storage for your belongings. Please don’t bring things (i.e. electronics) that are not waterproof. If you plan on using your cell phone to take photos, you should bring a waterproof phone case. You can actually find some good quality ones that are affordable on Amazon (click here to check price and availability). We used a GoPro Hero 5 Black for our video. It is waterproof and great for capturing action video like this. (Note: We have since upgraded to the GoPro Hero 7 Black click here to check price and availability). Ladies, you will also want to be sure to bring waterproof mascara! Check out my practical tips for visiting Niagara Falls for more helpful information to plan your trip. At the end of our boat ride, we were wet even with the ponchos! You feel a little mist from the American and Bridal Veil Falls. I was also surprised that there were no seats on the top deck of the Hornblower. Luckily, we got a spot in the front by the railing so that we had something to hold on to. Plus, I didn’t expect the visibility to be so bad. There were times I could not see at all and the noise from Niagara Falls was loud. I had no idea where on the river we were or how close we had gotten to the Falls. Looking back, that is all part of the fun of the experience. The Maid of the Mist got its name for a reason! Having said all that, I enjoyed my Hornblower Niagara Cruise experience and would do it again in a heartbeat. It was quite the adrenaline rush. Our video will show you what the Niagara Falls boat ride was like. I keep thinking back on the experience and just laughing! For daytime cruises, you cannot book a specific tour time. The boats are large and can carry hundreds of people so the lines will move reasonably fast. During peak days, I would recommend going early to minimize your wait time. It wasn’t crowded when we went, so we could have gotten right on when we got to the dock but we decided to wait and be the first people to board the next boat. That way we could get the best seat – well, place to stand. You don’t need to worry about where you end up standing though. Visibility is limited and you’re going to get wet anyway! For Maid of the Mist, you can purchase tickets online in advance but they are not for a specific day or time. If you are looking for a Maid of the Mist discount and plan on seeing other attractions on the New York side of the Falls, you may want to purchase the Niagara Falls USA Discovery Pass. We purchased our tickets at the terminal right before the cruise, but it’s probably a better idea to purchase online in advance to save time. For the daytime tickets, you can purchase your tickets online for a specific day but not a specific time. Your tickets are an email with a barcode which you can either print out or show on your phone (you must be online). If you prefer, the Hornblower Journey to the Falls Boat Tour is also included in the Niagara Falls Adventure Pass along with other attractions on the Canadian side of the Falls. After the cruise, we may be wet but we were all smiles! For the evening cruises, I would recommend booking as early as possible because tickets are limited and they do sell out. You can also save money by buying the Day & Night Cruise package. Going on a Niagara Falls boat cruise should be on your bucket list. Both the Maid of the Mist and the Hornblower Niagara Cruise offer similar experiences. Don’t feel like you have to choose the Maid of the Mist because of the iconic name, the Hornblower can be a good alternative especially if you stay on the Canadian side. Whichever boat ride you choose, I am sure you will love it. Have you been on either the Hornblower Niagara Cruises or the Maid of the Mist or both? I would love to hear about your experience. Location is the best way to choose when you are debating the Maid of the Mist vs Hornblower. If you are on the American Side of Niagara Falls, choose the Maid of the Mist. If you are on the Canadian Side, go with Hornblower Niagara Cruises, it’s basically the Canadian Maid of the Mist. Do not bring electronics that won’t fit inside your pocket or purse on your cruise. There is a high probability they will get wet from the mist. If you are bringing your cell phone to take pictures, consider also bringing a waterproof case . If you want to do one of the Evening Niagara Falls cruises, I would recommend booking in advance as those will sell out. I’ve heard the view is better from the Canadian side, so that would probably be a deciding factor for me. My parents went and they got completely soaked too, it was hilarious. Looks like so much fun, and the Horseshoe Falls are absolutely stunning! Michelle – yes the view is better from the Canadian side you can see all 3 falls. Both boats take the same route though so the views on the boats are the same. I hope you get to do one of them, it was a lot of fun! Very informative! I would think all of the cruises would be the same. Seeing the Falls at night would be really cool! Thanks Renada. The cruises are similar but its important to know the differences. And yes the way they light up the falls is so pretty! I actually never knew that there was three falls in total! It is pretty crazy how wet it got from the mist, I would have to be bringing a waterproof case. Sara – I didn’t really understand how the falls were laid out until I visited. And yes the mist is insane! I didn’t do my proper research before I went and I missed the opportunity to do the boat tours 🙁 I totally would’ve tried to do the night cruise… sounds so interesting (and probably a little spooky with all the mist). I guess I’ll have to go back! Katie – I didn’t get to do the night cruise either, so I definitely want to go back! Everyone I know loves Maid of the Mist and rave about it. It would be amazing to see from the Canadian side, as I have only seen from the NY side thus far! Tracy – Yes the boat rides are so fun. I hope you get to visit the Canadian side too! Jen – Glad to hear you agree and enjoyed your boat tour. I loved it there too. The Night Boat ride actually sounds the most appealing to me, just because I hadn’t heard of and think it could be amazing to use your other senses to experience Niagara. Maybe even with less tourists around the experience could have a whole other Feel. Ariana – I agree. The only downside is it might be a little chilly! I guess you just need to make sure you dress appropriately. Jean – Yes we really had a fabulous time! I’ve seen the falls from both sides and have taken the Maid of the Mist boat tour, but I had no idea about the Hornblower tour! Looks like you had a great time, thanks for sharing! Radhika – The Hornblower cruise is relatively new, so maybe they started it after you were there? I would love to see Niagra Falls again someday (the last time was when I was a toddler)! Your tip about not bringing electronics unless they’re waterproof is very helpful. The night cruise sounds really neat. Thanks for explaining the difference between the two boats! Erin – You definitely need to see the Falls as an adult. I hope you can make it back there. This is such great advice! I might just have to go back! Christine – Thanks, glad you found the post helpful. The falls just look amazing – i hope i get to visit one day (on either side!) – i love your picture after you talk about the cruise! That freah air happiness look is unmistakeble. Julz – Thank you! I hope you get to visit it too. We really just had so much fun! Thanks guys! Yes, I think the important thing is you must do a boat ride it doesn’t really matter which one! It’s been a long time since we visited Niagara Falls, but I can still remember how wet we were in that small boat that took us really close to the waterfall. We were wearing some ponchos, but that didn’t help much. I agree, it felt very windy there as well. Anda – it really is a memorable experience isn’t it! I did the Hornblower cruise last year and it was so much fun! You are right that you get very wet and I didn’t think to wear waterproof mascara so I was a mess by the end of it. Getting right up to the falls was such a huge rush as well. I really want to go back. Great tips and photos. Cristal – Glad to hear you enjoyed it too! And yes waterproof mascara is a great tip. Rachel – You are going to love it there. Just to clarify the routes the boats take are the same, they just start across the river from each other. We haven’t made it to Niagara Falls yet, but when we do, I’ll definitely be using your guide! Beautiful photos! The spray coming off the falls is always so impressive in photos. Bet it’s even better in person! 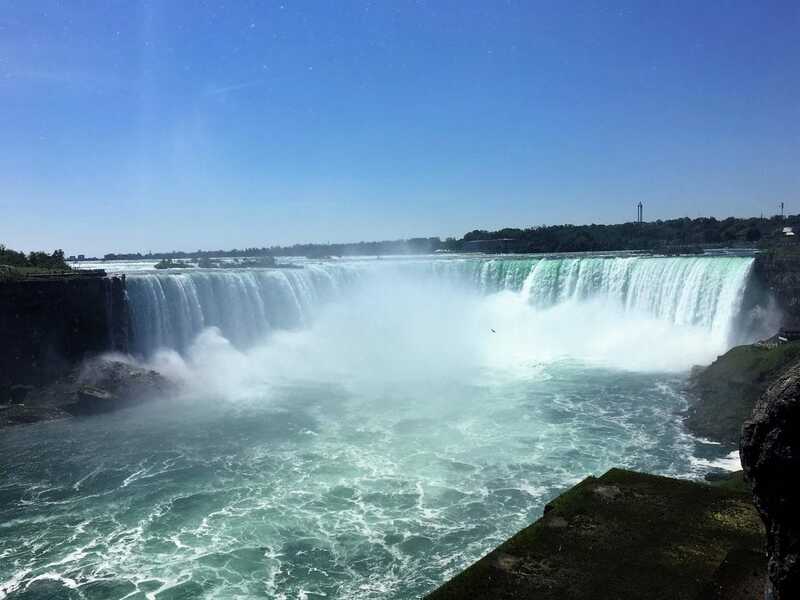 Sarah – Niagara Falls really is something that everyone needs to experience for themselves. It is hard to portray in pictures and words! Both tours sound amazing. Though the night tour would be something a bit different. Yes! You know we thought about trying to fit in the night tour but I was worried about how cold it might be out on the water especially with the mist. Julianne – Thank you! I love icewine so would love to go to the Icewine festival. I hope you get to go back in the summer. If you do, I also have a few other Niagara posts that you might find helpful. 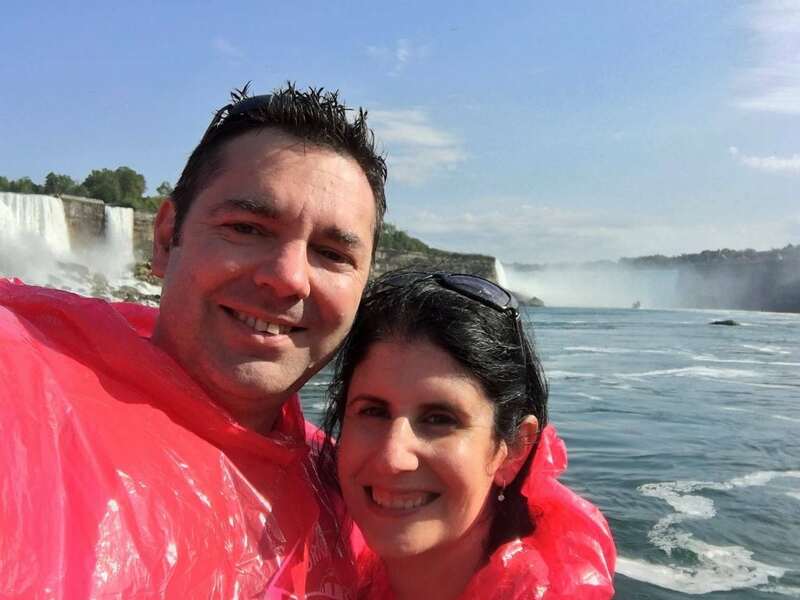 Lolo – The Hornblower has only been around since 2014, so I am guessing you did the Maid of the Mist. Great tips! I’ll keep these notes for my trip to Niagra! Susan – Thank you. You will love Niagara. I have a few other posts on my blog that you might find helpful as well. Wow. I had no idea there were night cruises and so many cruise options out there or that this cruise offers cruises to Alcatraz as well. Saving this for any future Niagra Falls trips so I can pick the beat option for me. Kelly – Yes there are several different options. We did also enjoy the cruise we took to Alcatraz with Hornblower as well. I hope you get to visit Niagara soon. On my bucket list! The nighttime boat ride sounds amazing! Thanks for all of the great tips—especially about the electronics. Melinda – I hope you get to go. Glad you appreciated the tips. I think I will try to do the nighttime boat ride next time I am there. Great tips and explanation on the difference between the two cruises. We’ve only done the Maid of the Mist tour several years ago and really enjoyed it. Ut’s fantastic to hear that there is now an alternative. We’d love to go back and do that night tour. Thanks Mary, glad you found the post helpful. I want to go back and do the night tour. Hi Anisa, looks like you two had a fun time. I’ve done the Maid of the Mist cruise twice as a kid and would love to return as an adult! Jessica – Thank we really did enjoy it. I hope you get to go back! Awe Susan! I hope you get the chance to go back. If you are curious about how misty it is, you can get a good idea by watching the video. Thanks for explaining the difference between going for these rides no matter which side of the falls you are located. Funny video at the end! what a wet journey!! Sylvia – Glad you found the post helpful and enjoyed the video! When we went 12 years ago we got on the Maid of the Mist on the Canadian side. Clearly things have changed. In those days the ponchos were big with lovely long sleeves so only our feet got wet. It was spectacular. Would love to go back and do it again. The roar of the falls was unbelievable. We also did the helicopter trip. That was also spectacular, and even my wife, who hates flying, loved it. So glad you guys loved Niagara Falls too. Funny you didn’t get wet! I would love to go back there and do another cruise too! Glad to found it helpful. I know you guys will have a great time! Thanks Hilary. Glad you found the post helpful. I figure I might as well share what I learned! As you said, that was intense!! Wow, absolutely incredible! My little nephew was watching your video with me and he said, ‘I can’t see anything!’, lol!! I explained to him about Niagara Falls, the cruise and the intensity of the water, mist and wind, etc – he was amazed by your video! Kat – So glad to hear you enjoyed it. I hope you get the chance to take your nephew there when he is old enough. Clare – So glad to hear that! You are going to love Niagara. If you get a chance we really enjoyed the Cave of the Winds too. I also have a post and video on that so you can see what its like. You noted that the Hornblower does not have seats. Does the Maid of the Mist have seats? I am going with my mother and she might need to sit down. Mel – That sounds great! I am sure you will have a wonderful time. Fellow Texan here, thanks for sharing. Had never heard of the Cave so excited to see about adding that to our trip! Howdy! Yes definitely visit the Cave of the Winds and go to the Hurricane Deck. We had so much fun!